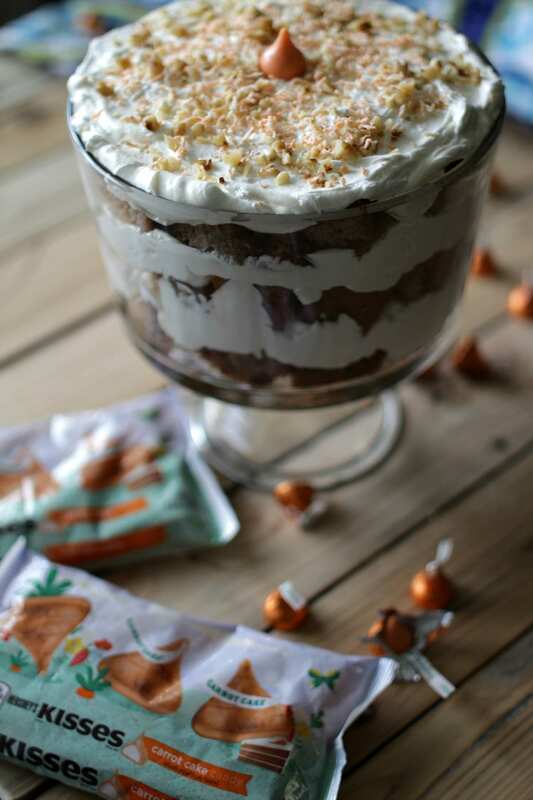 This Carrot Cake Cream Cheese Trifle features an important and tasty ingredient that will make your taste-buds dance — Hershey’s Kisses Carrot Cake Candies! Easter was always a big deal for me growing up — from the Easter egg hunt to the big meal and desserts. We would often times head to my grandparents house for an egg hunt and meal. It was a fun time of gathering together, eating enough to put us in a food coma and just enjoy the holiday. The one thing I really looked forward to was my grandma’s Easter cake. It was a yellow 3-layer cake with a light white frosting and coconut. She always topped it with coconut that was dyed green and jelly beans. It’s a cake I’ve continued to make when my kids were little and my mom still makes it as well. 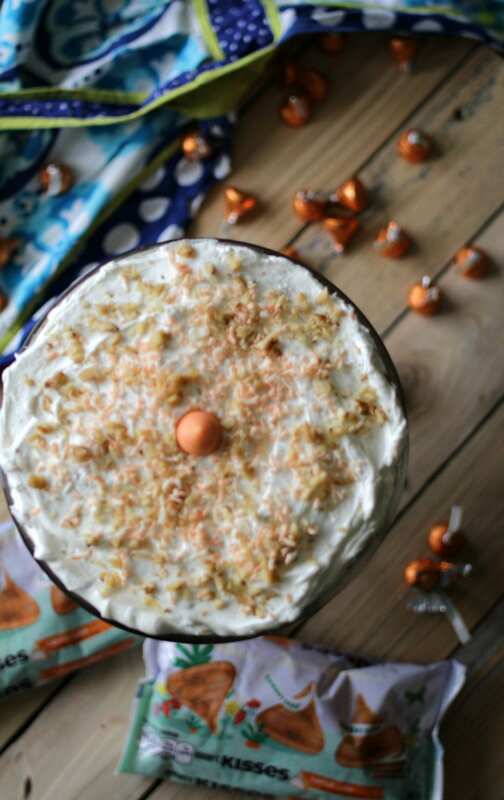 For Easter this year, I wanted to make a dessert which would incorporate one of my newest obsessions. I’m talking about Hershey’s Kisses Carrot Cake Candies. When I first heard about these my initial thoughts were that they sounded interesting. I’m a huge fan of their peppermint kisses, dark chocolate kisses and the good ‘ol original ones I grew up with, but I wasn’t sure if a carrot cake flavor would match up to my love for those. Well, they do. As you’ll see in a minute, there’s a creamy center that is melt-in-your mouth delicious. 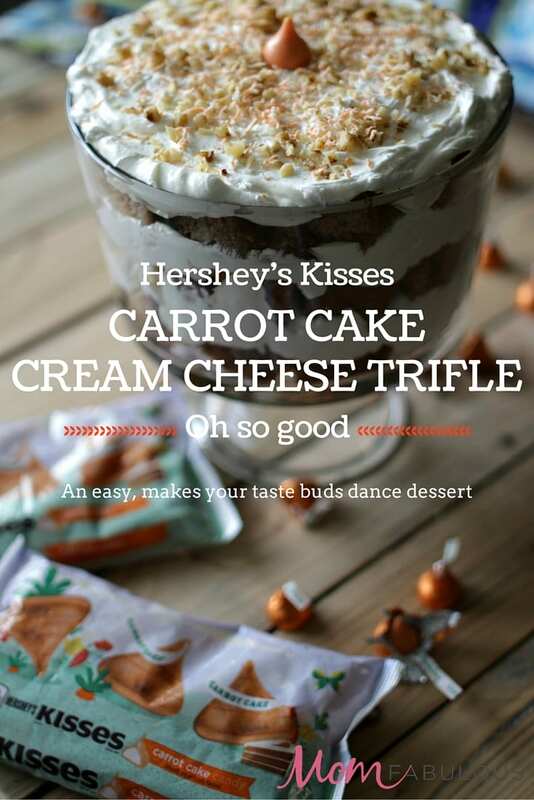 And since I love carrot cake, and carrot cake and cream cheese go together like peanut butter and jelly — that’s when I decided a Hershey’s Kisses Carrot Cake Cream Cheese Trifle was in our future. I am all about simple ways to do things — from the clothes I wear to the recipes I make. So this recipe is very easy and you can’t really go wrong! 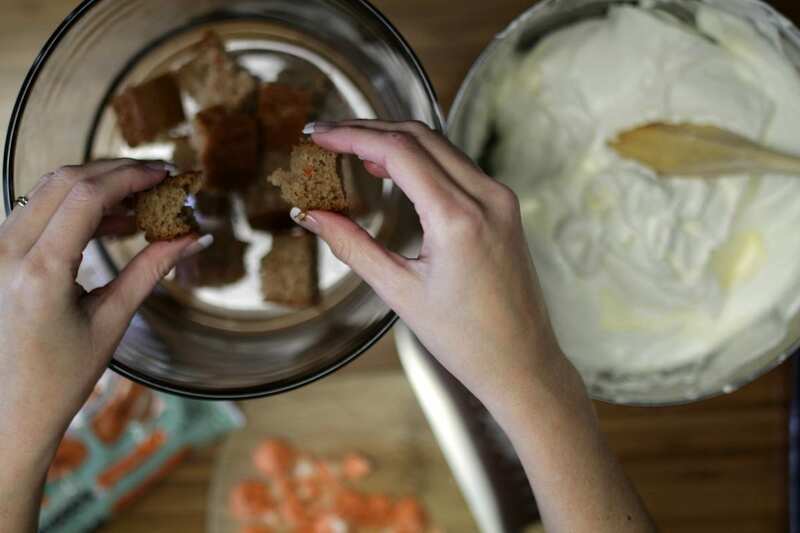 If you can bake a cake from a mix, you’re good to go. And if you can mix together a few ingredients like cream cheese and powdered sugar, you’re good to go! Bake a box mix carrot cake according to the packages directions. Let it cool and then cut it into squares. 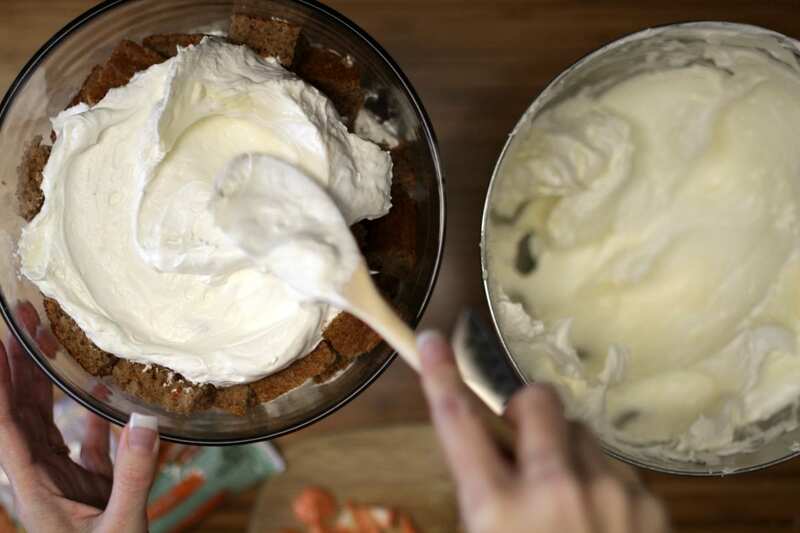 While the cake is cooling, whip up the cream cheese mixture. 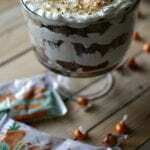 This is the same cream cheese mixture I use for one of my family’s favorite layered pudding desserts. I knew it would be perfect for this trifle. 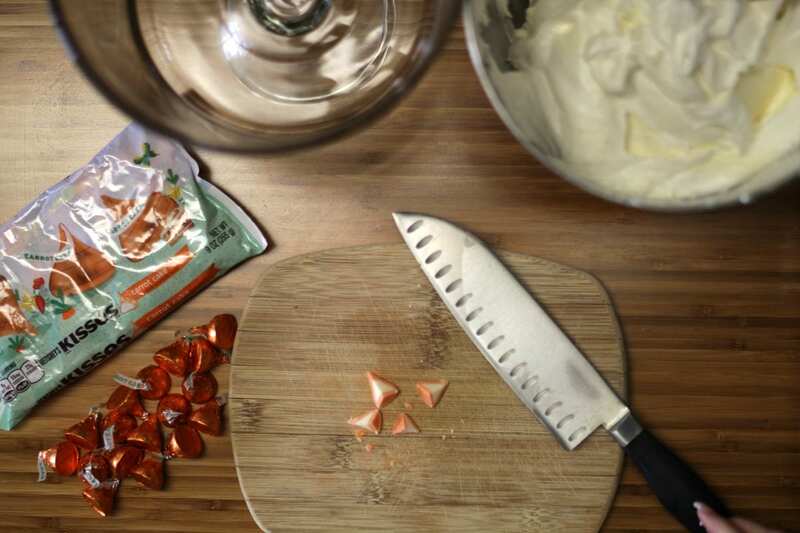 Cut the Hershey’s Kisses Carrot Cake Candies into fourths. Now you can see the middle of the kisses. Now start layering! 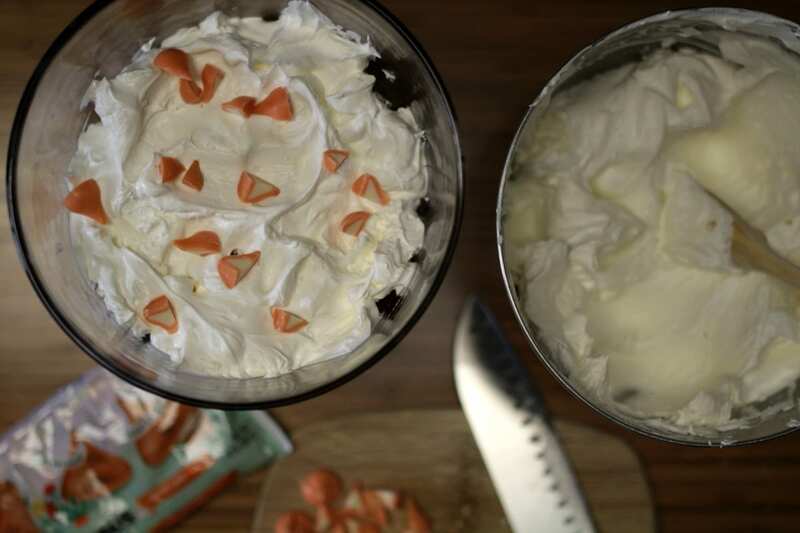 Take a trifle dish or glass container (so you can see the layers) and start with a layer of cake, layer of cream cheese mixture and sprinkle on some cut up kisses. Continue layering until either your dish is full or you run out of ingredients! I typically do three layers and did end up with enough leftover to make two mini trifles. And there is a scoop of the final product. Grab a cup of coffee because this dessert is so sweet and so decadent, you’ll want a sip of something. I always look forward to the holidays and what offerings Hershey will have. They have such a wide variety of new and classic treats for you to bake, create and fill your kiddos’ Easter baskets with. 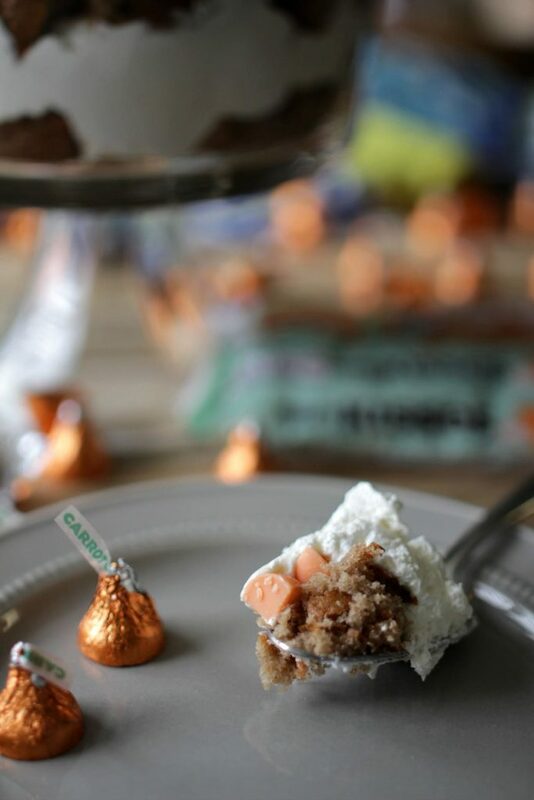 The Hershey’s Kisses Carrot Cake Candies are available exclusively at Walmart, so be on the look out for them! For more Easter inspiration, visit read more Easter crafts and treats. 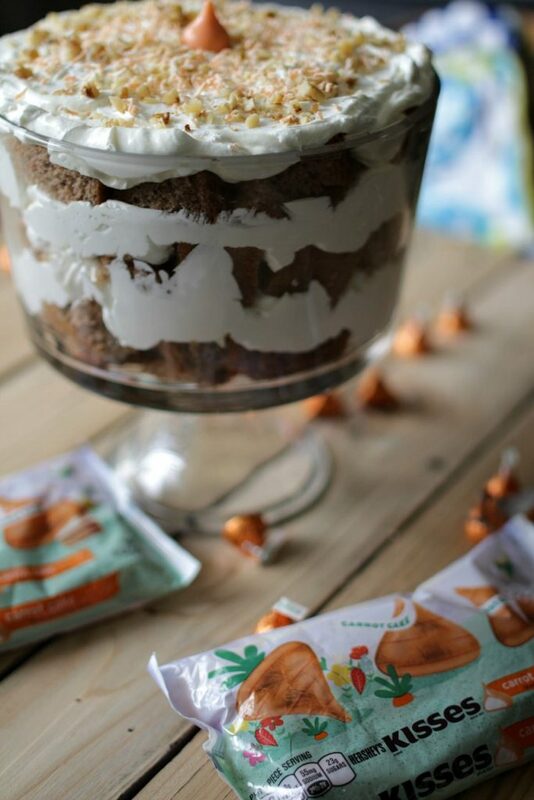 This Carrot Cake Cream Cheese Trifle features an important and tasty ingredient that will make your taste-buds dance -- Hershey's Kisses Carrot Cake Candy! 1. 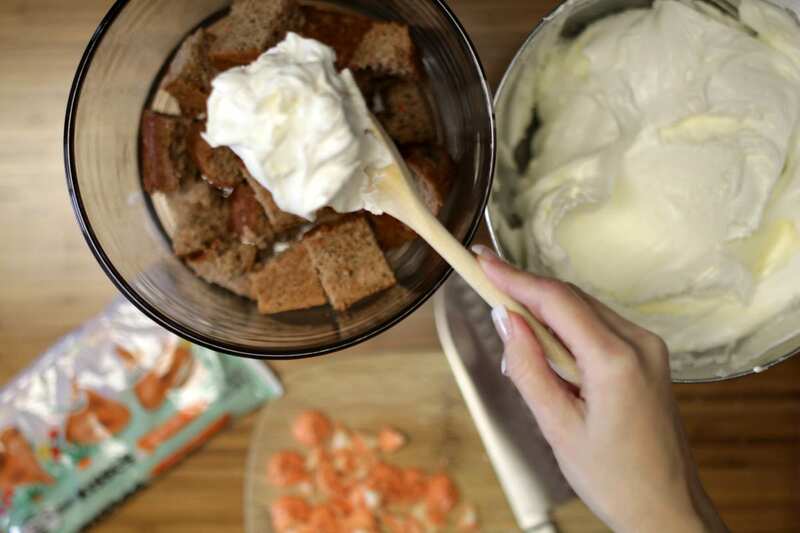 Bake carrot cake mix according to packages directions. Let cool. After cooled, cut into small squares. 2. To make cream cheese filling, with an electric mixer beat the softened butter and cream cheese together until light and fluffy. Turn the mixer to low speed and slowly add the powdered sugar, a half cup at a time, and mix. Add enough powdered sugar until it's your desired consistency. I typically use all 3 1/2 cups. Add the vanilla and continue to beat the frosting on medium speed for 2 to 3 minutes. Fold in the 16 oz cool whip topping. 3. In a trifle dish or glass dish of some sort, put a layer of cubed cake first, then spread out a layer of cream cheese mixture, then sprinkle with chopped Hershey's Kisses Carrot Cake candies. Continue layers two more times ending with cream cheese mixture. 4. Sprinkle with chopped walnuts, shave/grate one Hershey's Kisses Carrot Cake candy onto top layer and end with one whole kiss in the middle.